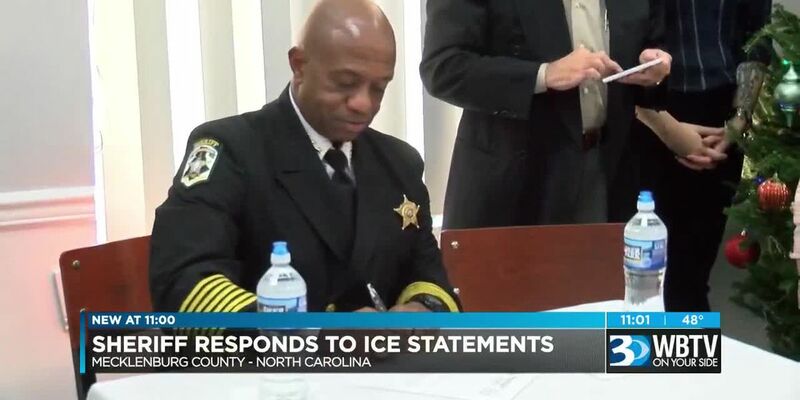 CHARLOTTE, NC (WBTV) - The Mecklenburg County Sheriff’s Office has issued a formal response to the recent wave of arrests and raids made by ICE agents in Charlotte over the past several weeks. In the statement, Sheriff Garry McFadden describes the decision by ICE agents to more aggressively pursue illegal immigrants with criminal records as a form of, ‘cynical fear mongering’ and as a deliberate response to the County’s decision not to recognize the 287(g) program in particular. The Sheriff’s Office further pointed out that they work with ICE on a number of other law enforcement responsibilities including the honoring criminal warrants filed by judicial officials, providing ICE officials with access to arrestees/inmates who have an ICE-related warrant and alerting officials when an individual is arrested with an ICE warrant. Sheriff McFadden concluded the statement by calling on ICE to work with the Sheriff’s Office on assisting with arrests of all criminals rather than just immigrants in the city.